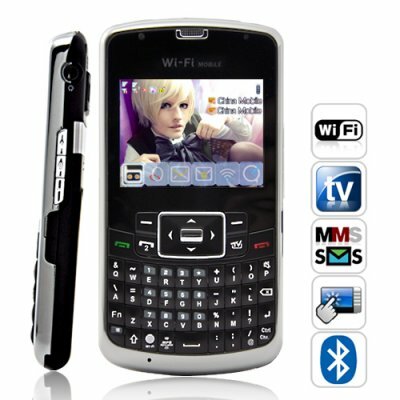 Successfully Added Amigo Pro - Touchscreen WiFi Dual-SIM Cellphone with QWERTY Keyboard to your Shopping Cart. You asked for it, now it's back and better than ever - say hello again to your new best friend, the Amigo Pro! Sporting the same classic features you loved before (including WiFi, Quad Band, Dual-SIM, and a QWERTY Keyboard) the Amigo Pro now also comes with tons of improvements, including a beautiful new touchscreen! Welcome to the next stage in mobile phone dominance! If you could only choose one phone to take with you on your way to the top, we suggest The Amigo Pro. It's got brains, brawn, and beauty all in one! Brains: The Amigo Pro is a first class quad-band mobile phone that operates seamlessly on the four standard global GSM frequencies (850MHz, 900MHz, 1800MHz, 1900MHz) so you can trust it to work anywhere in the world. It also has two SIM card slots, which is perfect for people who want to keep two active phone numbers inside one great phone! More importantly, the Amigo Pro was never locked so you can use it with any cell carrier or network you want. Brawn: In terms of communications, what's more powerful than web access side by side with cellular networks? And with the Amigo Pro, getting on the internet has never been easier. Simply scan for available wireless connections. Choose your connection and click "Connect". Seconds later, you're checking email and surfing the Internet. Add to that, versatile media functionality to play all your favorite audio and video formats, a still and video camcorder, radio and TV and you can even install java apps... how's that for power? Beauty: Designed with both elegance and convenience in mind, the The Amigo Pro will wow you with its 10mm thick candy bar form, beautiful 2.3 inch touchscreen, and generously sized QWERTY keyboard. Combined with its responsive user interface, intuitive menu, 7 handy action buttons, and 4 directional keys for extra input precision, this smartphone has everything you need for the best user experience! The Amigo Pro is a powerful interactive intelligent cellphone perfect for today's business man or woman. Don't delay, click "Add to Cart" right away and in a few days you could be the proud owner of this state-of-the-art Touchscreen WiFi ready Dual-SIM Quad Band QWERTY keyboard mobile wonder! Brought to you by the leader in factory direct China electronics - Chinavasion. it is a very outstanding product with a good sound system. People love it very much.I will buy some more cos its a very good revenu for my business. Excellent phone! I have bought 3 of them. One for myself & 2 for my friends. This phone works and looks perfect. At first glance persons even thought it was a blackberry. The only issue I have is that the buttons were not designed to allow usage in the dark i.e. there is no back light for the buttons which in some cases does that afford me the ability to type as quickly, though it is a touch screen but its much easier to type using the key pad. The phone looks very nice. Works perfectly! on 2011-07-13 01:32:47 muy lindo! mi pedido llego en perfectas condiciones y el teléfono esta hermoso!! !